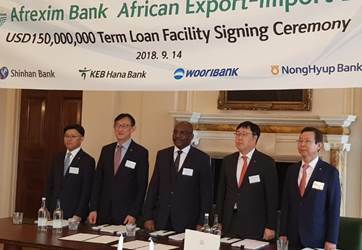 Cairo, 18 Sept. 2018: – The African Export-Import Bank (Afreximbank) has closed a Korea-focused $150 million club facility which has Shinhan Bank as coordinator and lender. Other banks participating as lenders in the facility, which has a three-year tenor, are KEB Hana Bank, Woori Bank and NongHyup Bank. Speaking at the signing ceremony held in London on 14 September, Denys Denya, Afreximbank’s Executive Vice President in charge of Finance, Administration and Banking Services, said that the facility would greatly enhance Afreximbank’s capacity to achieve its core mandate, in particular, expanding intra-African trade, supporting export manufacturing, and significantly filling the trade finance gap the continent was currently experiencing, by providing it with the requisite funding capabilities at competitive pricing. “The Facility also helps Afreximbank to diversify its sources of funding by geography, instrument and investor base,” continued Mr. Denya. He noted that despite being a debut facility in the particular market, the facility, which targeted to raise $150 million, was oversubscribed to the tune of $160 million, with four banks joining in, saying that the development was clear testimony of strong confidence in Afreximbank. Mr. Denya commended all the institutions that participated in the facility and noted that while banks in Korea had participated in previous fundraising activities, this was the first time a facility specifically focused on Korea had been arranged for the Bank. He said that Afreximbank saw a lot of opportunities for collaboration in Africa and invited the participating banks to work with it as it invested in the continent, adding “it is my fervent hope that this targeted facility is the first of many more similar to come”. Accompanying Mr. Denya to the signing ceremony were Afreximbank Treasurer Chandi Mwenebungu and Douglas Tsetsetse of the Treasury Department.